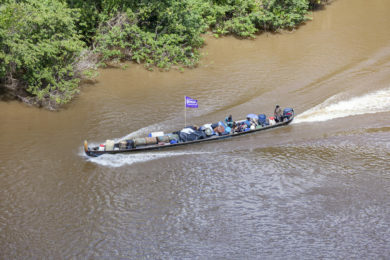 My source lies in southwest Suriname, at an altitude of 700 m, and I cross the Amazonian forest for 610 kilometers before I flow into the Atlantic Ocean. I form a natural border between Guiana and Suriname. Furthermore, I am a key communication channel and a melting pot between local populations: trade, passenger transport, access to schools, healthcare etc. Almost all the economic and social activities are going through me. I am a heavily used but perilous waterway for navigators, due to my numerous cascades. With its 83 856 km2, Guiana is the largest French overseas department. Located between Brazil and Suriname, Guiana benefits from a geographical situation and exceptional natural resources. 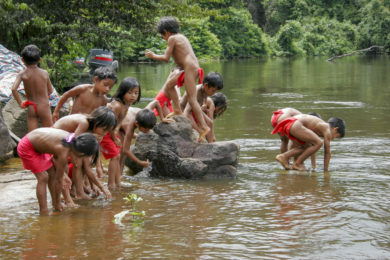 Covered by more than 95% by equatorial forest, its ranks third in terms of available fresh water, with its two large rivers, the Oyapok and the Maroni, and its myriad rivers. The water resource is abundant but underexploited, whether for access to drinking water, navigation or energy supply. And water is often a vector of diseases. For centuries, I was the subject of negotiations between France and the Netherlands. I officially became a border in 1713, following the signature of the Franco-Dutch treaty of Ultrecht. In 1860, French and Dutch argued about the delimitation of the border, and it it was fixed on the lower part of my flows, named Litani, not before 1935. 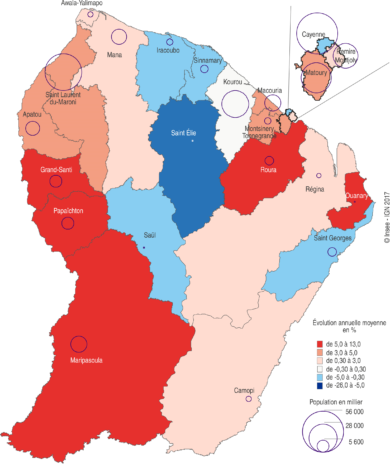 However, this delimitation is still contested by Suriname. The absence of a clear border is further complicated by my lack of legal status. The social reality is a completely different situation, since I had always provided a place where populations circulate and mix, and a basis of local identity. For almost thirty years, Guiana has been subject to an anarchic gold rush with illegal prospection scattered for the most part in the deepest forest. 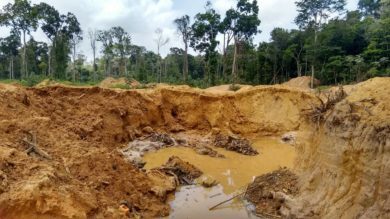 Even if the phenomenon is hard to quantify, it is estimated that 10 tonnes of gold are produced illegally by 6,000 to 10,000 clandestine prospectors, mostly Brazilian, in an area covering almost 7.5 million hectares. This activity has major human and ecological impacts: deforestation, destruction of rivers and soil leaching, contamination of water by mercury, insecurity and precarious health. In French Guiana, there are more than 25 different ethnic groups, speaking their own languages! These groups include Bushinengues, Amerindians, Europeans, Asian immigrants and other people from more recent immigrations (Lebanese, Brazilians, etc.). The Bushinengues, also called Black Browns, are the descendants of the African slaves taken to Suriname to work on the plantations. In all, 4,000 Bushinengues (6% of the population) live on my banks and in the large towns situated on the coast, such as Kourou, Cayenne, and Saint-Laurent du Maroni. There are also the Amerindians (about 12% of the Guianan population), the Guianans whose mother tongue is creole (30%), the Europeans (15%). Guiana is experiencing a high birth rate, and its population is expected to reach 316,000 inhabitants in 2030 (for 274,150 today). This demographic surge has led to the creation of “mushroom districts” (50% of the habitat of the town of Saint-Laurent du Maroni) without access to drinking water and drainage. Also, over the entire region from 13 to 20% of the population live without electricity. With the Oyapok River, we are not listed among France’s navigable waterways, but boats use our rivers anyway. For example, I am the only means of travelling from the inland regions to the coast and between the two countries. Canoes transport goods and passengers daily and are also used as shuttles for schoolchildren. More than 20,000 people use me, 10,000 tonnes of goods and 30,000m3 of fuel are transported every year on my flows. At present, I am not used as a source of clean energy. Nonetheless, potential for small hydropower installations have been identified. More than 46,000 people do not have direct access to drinking water. The situation is particularly problematic in my basin, with the dispersion of the population over a huge territory and demographic growth. That’s why it is vital to increase the capacity for producing drinking water and strengthen the network. Typhoid, cholera, dysentery or acute gastroenteritis: water is a vector of numerous parasites, responsible for waterborne diseases. 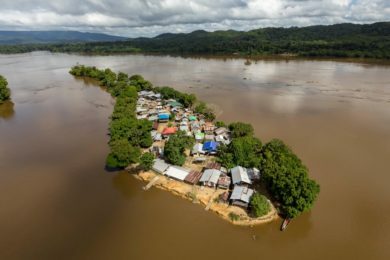 Thanks to improvements made to the habitat and access to drinking water, typhoid is now becoming less common, but influxes of migrants have led to the emergence of new diseases. Inside inland, the people use surface water from rivers and creeks for every domestic need (toilet, washing dishes and clothes, etc). These are water points where insects and parasites proliferate, vectors of many diseases leading to a very high infant mortality due to diarrhoea. Despite 18 healthcare centers (CDPS) and a mobile public health team, malaria, yellow fever, chikungunya, zika and dengue, which are tropical diseases transmitted by mosquitoes, continue to seriously affect populations. The region of Maroni is the most affected by endemic malaria and dengue epidemics, linked to stagnant urban water which is also increasingly frequent. Hello, I invite you to visit the following page, on the Initiatives for the Future of Great Rivers (IFGR) website :The Maroni https://www.initiativesrivers.org/rivers/the-maroni/ Best regards.